Stompump knows that the leg muscle is stronger than the arm muscle. And in the case of cyclists, this is even more pronounced as cyclists exercise their legs about a thousand times more than their arms. Add to that the concept of body weight and the genius of the foot pump starts to reveal itself. And a foot pump is anchored to the ground while a hand pump has to be supported on each side. Stompump costs $100 and weighs 185 grams. So does the concept of a trailside, portable foot pump make sense? If it’s such a good idea, how come nobody has successfully sold one before? The problems are sturdiness, size, weight, dirt contamination and cost. 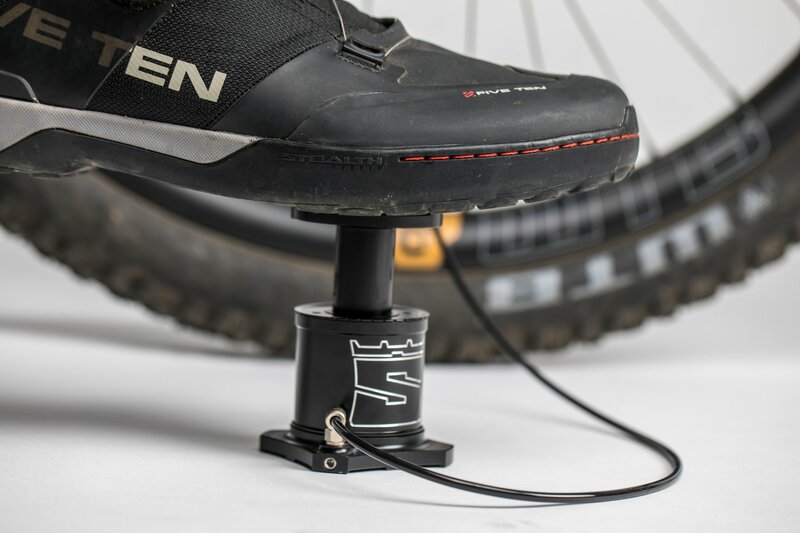 Foot pumps are bigger by nature so it requires careful engineering to make them small but sturdy enough to withstand the rigors of the trail and getting stomped on by a tired and frustrated 200+ lb mountain biker. The engineers of Stompump have given this problem an admirable effort by producing a sturdy and smooth pump for $100. Everything about it exudes quality from the pump action to the svelte hose and the industrial fittings. It sure is easy to inflate a tire to 25 psi so we can’t wait to use it on the trail. Stompump uses the most powerful muscle of the body to get up to 60 psi easily. But there are difficult issues to overcome before this can be successful in the marketplace. The most significant problem is its size and bulk. It’s 185 grams and about the size of a large coffee cup. So it’s significantly larger than the tiny pumps riders use today. Thus there is the issue of how to transport it as its natural spot is to take the place of the water bottle. That is hallowed ground to many riders though as many riders now revere their one water bottle spot. Stompump has attempted to address this with a strap to mount it on the bottom of the downtube. That works but it is unsightly. Carrying this on a backpack or a hip pack is the next likely scenario. It is, however, a fairly sharp, industrial piece with harsh angles. It needs to be sufficiently padded to protect the rider in case of a crash. The other issue is one of cost and ROI. $100 is a lot and the size is an inconvenience. So the rider has to weigh its benefit with the likelihood of a flat tire in this day and age of tubeless tires and sealant. If one uses a portable pump once a month or once every 6 months, it may not be worthwhile. 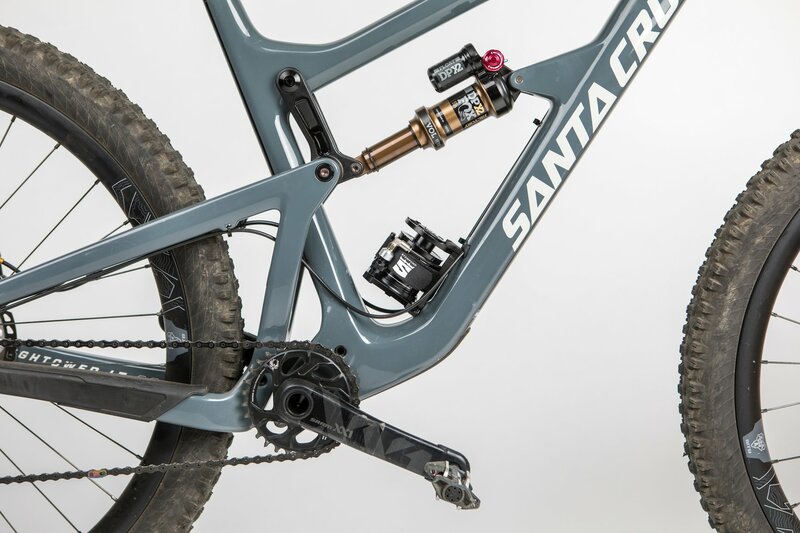 If however, one is leading a group down a shuttle ride on Downieville’s 17-mile rocky descent, this could garner the Stompump owner hero status. And if a rider gets a lot of flats wouldn’t they just buy a bigger portable pump that have a base that sits on the ground, for half the price? We shall see once we get this pump in our hands. Will you buy one? Why or why not? 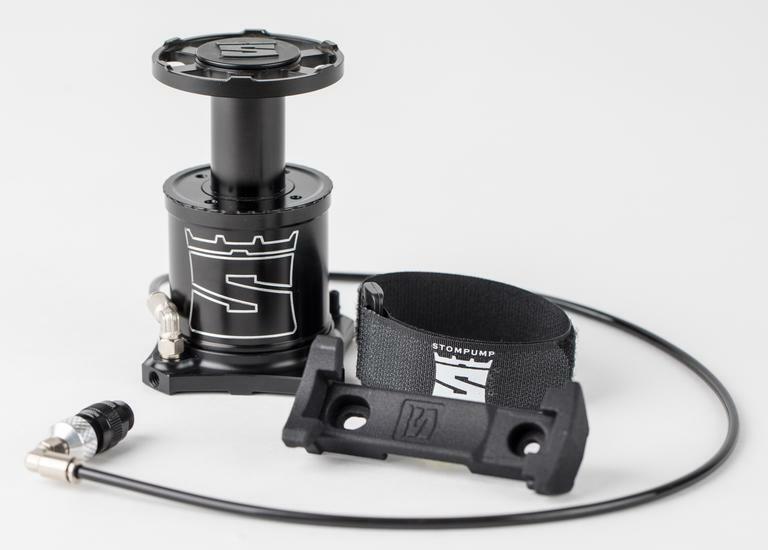 Stompump can be placed in the water bottle location or under the downtube. To learn more, check www.stompump.com. Stompump can be placed in the waterbottle location or under the downtube. In the last five years of riding I’ve only used my hand pump three times. All $12 of it. and It works just fine. While it’s a commendable effort, I can’t see myself carrying one on the trail (I have a hand pump for that) and I keep a floor pump in the car, so where’s the market? Perhaps guides might have a use for it, but that’s a tiny market. It was a huge mistake not to make it pack-friendly. I also question how well it will work on soft or uneven ground. Sorry guys, I won’t be buying one. Needs to be of great quality and $40 or less!